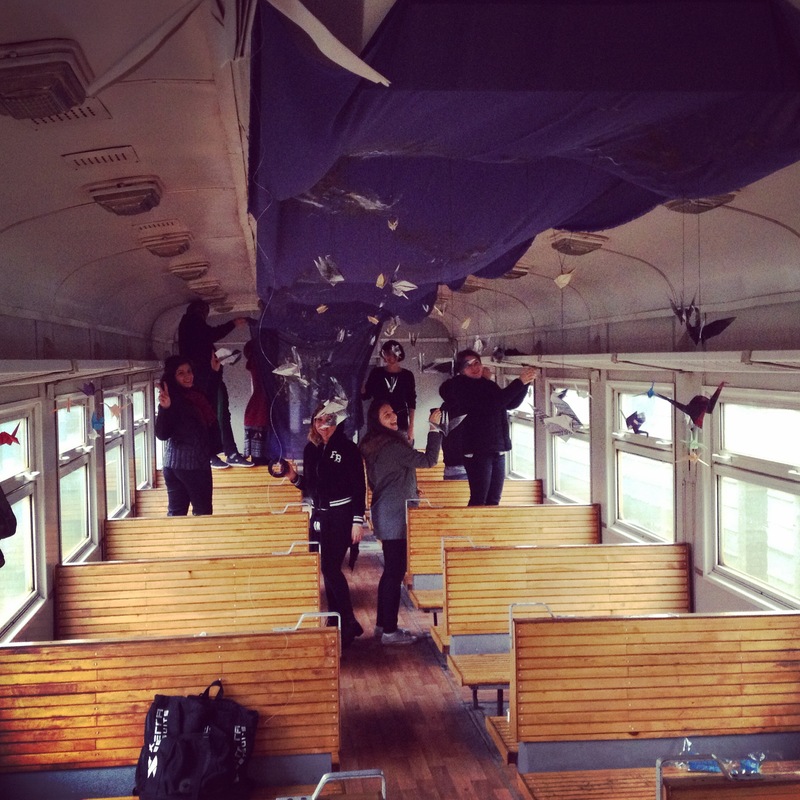 A few months ago, Anna had the crazy idea of setting up an art installation in the Yerevan-Gyumri train. Last week, we finally did it! 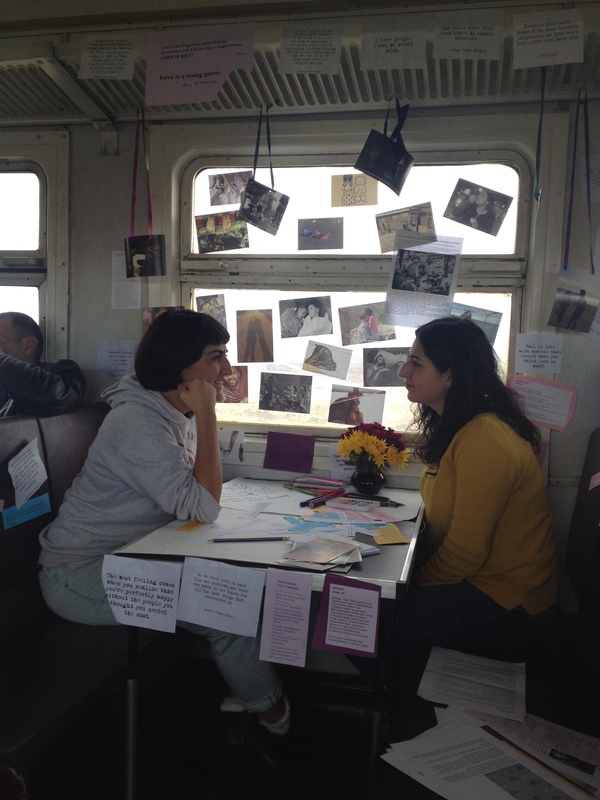 We set up different art installations in two of the trains doing the liaison between Yerevan and Gyumri. One of the installations was curated by TUMO Center for Creative Technologies. They created a beautiful photo installation in one of the oldest (and most charming) train wagons, presenting the photographs their students had taken on this very train last summer. We dismounted the art installations in both trains on Sunday. After two weeks of intensive work and many train rides, it’s time for us to thank our artists, performers, partners, volunteers and helpful friends, without whom “In Motion” may have never come to life. First of all, we want to say a big thank you to our sponsor, Apaga Technologies. Apaga Technologies is the forerunner in bringing high-speed Internet access across Armenia…and a precursor in artistic patronage as well. The CEO, Michel Davoudian, has a soft spot in his heart for Gyumri, where one of Apaga Technologies’s two offices is located. Apaga Technologies believed in the potential of our project from the start, and especially in its capacity to bring visitors to Gyumri. Throughout our three first exhibitions, we often received in-kind corporate sponsorship (wine, free wifi, equipment rental, etc.) but benefiting from Apaga’s financial support was more helpful than I can say. Thanks to their sponsorship, we were able to finance art production for two of our wagons, pay for our performers’ travel expenses, and finance our printing costs (exhibition material, wall text, wall labels, programs…). Thanks APAGA! We were lucky enough to collaborate with many talented artists for “In Motion”. The art installation in “The Nest” was the result of a collaboration between artist Lilit Markosian and the HAYP team. The origamis were created in a joint effort by the community, during a Crane-Folding party at AEON Anti-Café on October 22. “218 Minutes: A Moving Snapshot” was curated by TUMO center for Creative Technologies. All the photographs featured in that wagon were taken by TUMO students last summer, as part of a photography workshop under the direction of international food photographer John Lee. The installation in the “CHAOS” wagon was a collective effort realized by artists Judith Appleton, Jenny Gevorkyan, Laura Ghaltaghchyan,Vahagn Hamalbashyan, Melanya Hamasyan, Nina Romà Agvanian and Laurie Alvandian (for Little Free Libraries), Mkrtich Matevosian, Ofel Militosyan, Nush Petrosyan, Avetik Vardanyan and Hrachya Vardanyan. 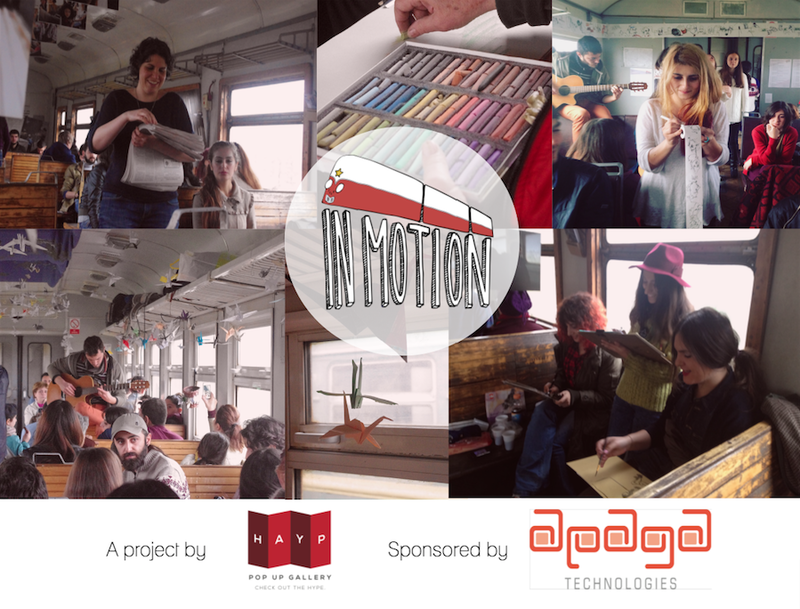 During “In Motion”, HAYP Pop Up Gallery worked with more than 20 performers to radically transform the traveler’s experience in the train. Achod Papasian inaugurated our first train ride with acoustic guitar. BA-AR-DI-A Dance (Therapy) Studio made a lasting impression on travelers with their contemporary dance performance “Your suitcase is heavy”, by playing with the movement of the train, the transparent wagon doors and the luggage racks. 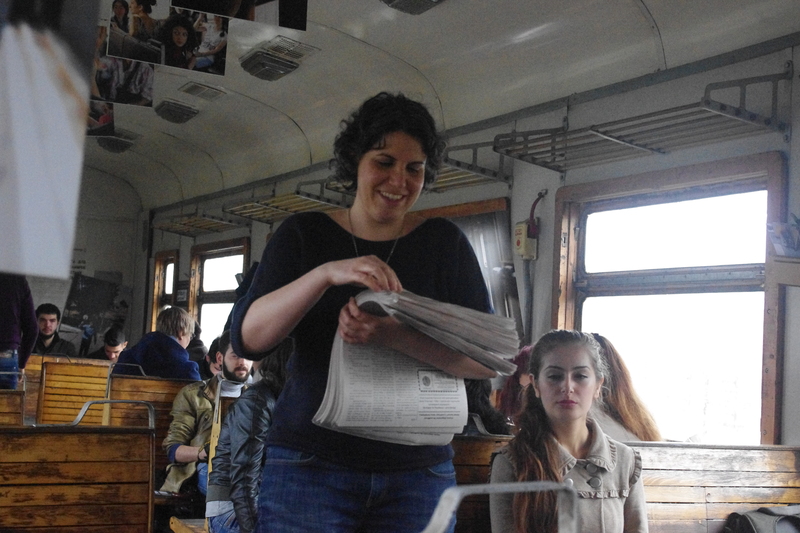 Nairi Hakhverdi performed a “Literary Train” piece, where she handed stories from the 1920s for the travelers to read. The first story, featured on a beautifuly designed old-school newspaper, was titled “Transit via Bayandur” and allowed readers to go back in time and return to the present, recognizing that only very little has changed over time. 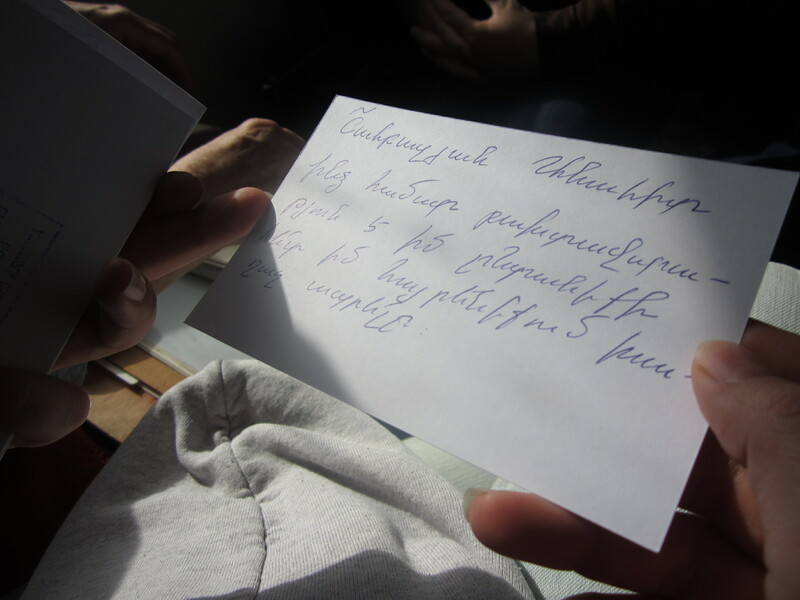 The second piece was interactive – passengers were invited to read “We Also Need a Ticket ? », a complaint written in 1928, and to share a train story of their own. She still has copies available, contact us if you’re interested! Shushanna Aristakeyan, Avetik Vardanyan and Hrachya Vardanyan created a cosy “salon atmosphere” in one of the train booths, and invited travelers to have their future read in the coffee cups. Anahit Erkoyan, Varsenik Erkoyan, Lusine Sargsyan, Marine Alexanyan, Alyona Gevorgyan and Mariam Dashtoyan, all students from Yerevan’s Fine Art Academy did a live-sketching performance on the train, interacting with travelers and creating on-the-spot drawings and paintings. Barbara Karsh-Chaïeb did an amazing job with her interactive performance “Train Office (a meeting point for ephemeral memories)”. Armed with a little cardboard box of blank cards, she approached train passengers with a question “what is luck for you?”. Participants could write one or more sentences on an index card, and read and reflect on the index cards that were already collected. Marisol Khadeyan delighted train passengers on Saturday by playing Latin American folk songs on the guitar, and ended the performance by a traditional Armenian song. Nina Romà Agvanian and Salpi Apkarian (also known as Balleti Paruhee) performed two times, on the train ride to Gyumri on Saturday morning and on the way back on Sunday. Their theatrical dance performance “Friday to Friday”, was based on the idea of a commuter train, which passengers ride from Monday to Friday. With a mix of dance and theatrical movement, the piece referenced interactions that could happen throughout the workweek, both fantastical and everyday. It was a definite hit amongst passengers, who found the unique piece charming and entertaining. Vahe Matteos Hakhverdian, a young and talented singer who has been studying Italian opera for five years, participated in “In Motion” as well. The entire wagon fell silent as Vahe began singing a cappella. His beautiful improvisational performance led to the audience requesting an encore. For nearly an hour during the Saturday morning train ride, Sevana & the boys transformed what is usually a normal passenger cart into what can be best described as a “kef” (party) wagon. Sevana Tchakerian, Arpa Vartanian and Oshin Safarian encouraged the travelers to participate and sing along as they performed traditional Armenian folk songs with an accordion and a guitar. To our performers – for all your preparation, hard work, energy, and good vibes… thank you a million times! For this project, we worked closely with the South Caucasus Railway, the company managing the railways in Armenia. They liked the novelty of the idea (nobody had ever set up an art installation in the train before), and saw its potential to increase the train’s appeal to Gyumri-bound travelers (who often use mashrutkas or shared taxis). We’re very pleased to say that the South Caucasus Railway’s management was happy with the result – both with the look of the art installation of the wagons, and with the increased attendance during those four days. In one word, it was a successful collaboration, to the extent that we’re going to renew it: next summer, the South Caucasus Railway will take you to HAYP’s first Art & Music festival, FLOW! We’re also happy to have brought people from Yerevan to our partners in Gyumri. 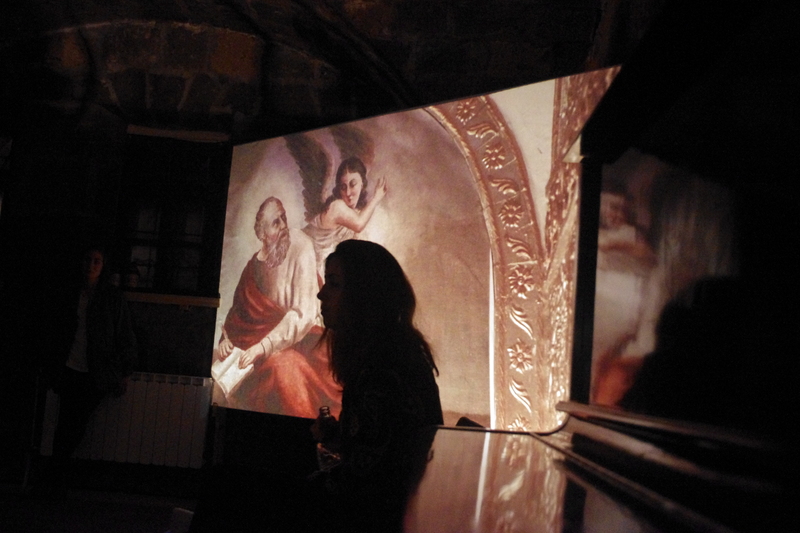 The initial trigger for “In Motion” was the Luys i luso multi-media installation at the Italian consulate in Gyumri. We worked with Emily, Alex and Natalia and Armine Khamoyan to synchronize our two projects and make sure the passengers in the HAYP train continued their journey in Gyumri with Luys i luso. 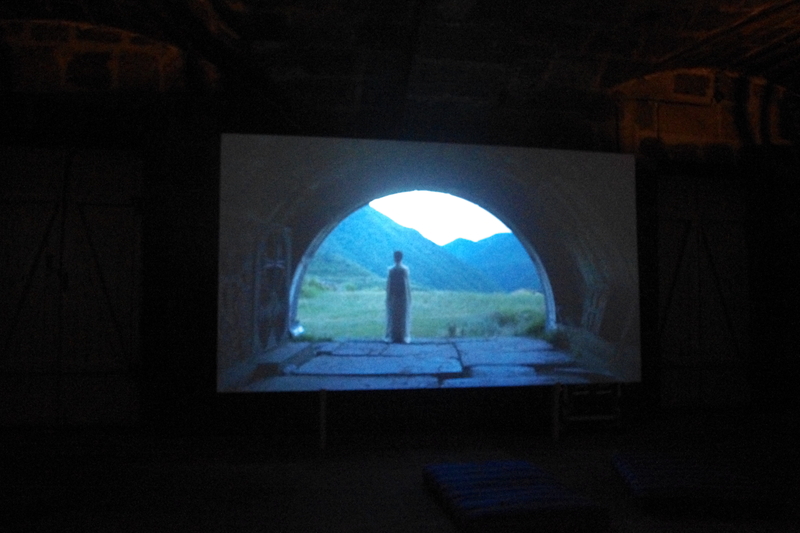 The installation was absolutely fantastic – a three-dimensional immersive experience based on Tigran Hamasyan’s performances in ancient Armenian churches both in Turkey and Armenia. For “In Motion” we also collaborated with Berlin Art Hotel and Villa Kars, two amazing hotels in Gyumri that offered discounts on rooms during those four days. We also want to thank our amazing friends who volunteered their time during “In Motion”. First, and most importantly, our translators: Liana Dashyan translated most of our English content to Armenian (facebook events, press releases, wall texts). Because we work on a crazy schedule, we also requested many of our friends for last-minute translations and reviews. Thanks to Zohrab Bauer, Arpa Vartanian, Lusine Vardanyan, Aram Khatchatryan, Sonya Armaghanyan, Gohar Khatchatryan for your hard work (and your patience with our self-translated facebook messages)! For “In Motion” graphics (our logo and amazing looking poster) we asked for the help of our friends Hovig Tashjian and Karine Vann, who did an amazing jobs and both spent sleepless nights on the project… It’s amazing to be able to rely on such talented friends – thank you both for your talent and dedication to the HAYP!! Thank you also to our awesome installation crew in the Origami wagon – they woke up at dawn to follow us into the “depot” (that weird train garage on the outskirts of Yerevan) and climbed on the wagon ceiling to hang 1000 origami cranes with fishing line in less than 3 hours… You guys rock! We extend special thanks to: Garni Baroni, who actually took part in the installing AND the de-installing four days later, our BirthRight volunteer Setrag Shahikian for helping with the installation set-up and taking photographs, Ani Carla Kalafian for acting as our social media guru… and getting us featured by Live Love Armenia on Instagram! On a final note, we also want to thank all those who rode the train and gave us positive feedback, both those who came specifically for “In Motion”, and those who ride the train everyday and were happily surprised by the installation. We created this train exhibition to reach out to people who don’t usually go to gallery openings; to add a little spark in the traveler’s journey; to bring more tourists and business to Gyumri, Armenia’s second (and often underrated) city. All the efforts we put in our exhibitions, the sleepless nights, the 12 train rides a week, the coffee overdoses, are all volunteer-based – we do it because we love the HAYP and believe that art has the power to make positive change within the community. Your support and recognition mean a lot to us!